Catherine Deneuve (born 22 October 1943 in Paris, France) is a French actress. Born Catherine Dorléac, she is the daughter of two well-known actors. She has two sisters; Françoise Dorléac (1942-1967) and Sylvie (born 1946), also both actresses, the former was killed in a car accident. She has a maternal half-sister, Danielle (born 1937). She began to appear in movies as a teenager. Her first major role was in Jacques Demy's movie Les Parapluies de Cherbourg in 1964. She has since then worked with some of the greatest movie directors, notably Roman Polanski's in Repulsion (1965), and Luis Buñuel's in Belle de Jour (1967) and Tristana (1970), as well as François Truffaut's in Le Dernier Métro (1982). She also made commercials for the perfume Chanel No 5, and was a close friend to fashion designer Yves Saint Laurent, often wearing some of his creations. She was married to British photographer David Bailey (born 1938) from 1965 until they divorced in 1972. She has had relationships with movie director Roger Vadim (1928-2000), with whom she had a son, Christian Vadim (born 1963), and Italian actor Marcello Mastroianni (1924-1996), with whom she had a daughter, Chiara Mastroianni (born 1972). Both her children are actors. 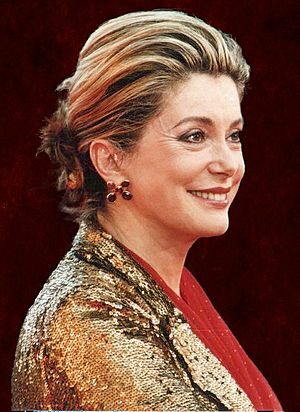 Deneuve at the 2011 César Awards. Catherine Deneuve Facts for Kids. Kiddle Encyclopedia. This page was last modified on 10 April 2019, at 10:08.